There’s just no telling how far I’ll go! We had planned a Moana moment as we sailed the seas on these very ‘authentic’ (of dubious sea worthiness) fishing boats. 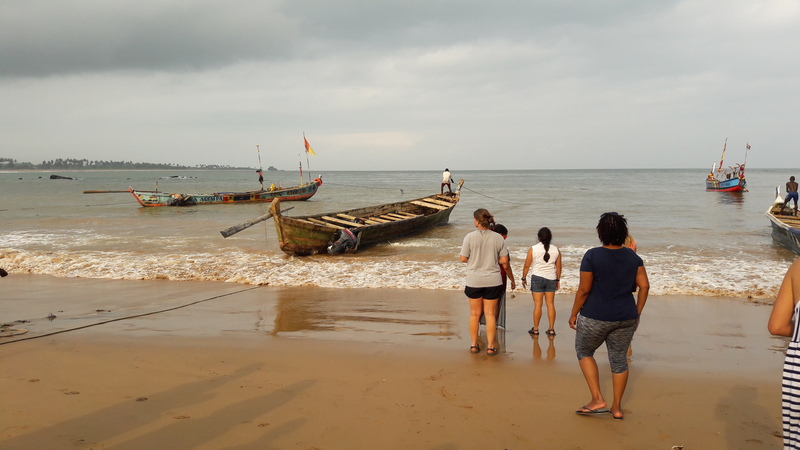 In reality we struggled to maintain any sense of dignity clambering into the boats from the breaking waves at the shore and getting soaked to the skin by both the spray as we sailed and a torrential downpour. This adventure has helped me to broaden my horizons. The first few days here were honestly quite confronting as I witnessed a greater level of poverty than I have experienced before. Since then I’ve travelled hundreds of miles in rickety vehicles on rather holey roads, been in a traffic jam caused by a water melon truck, mastered the art of decanting water bags into bottles, been peeped at by every single taxi, had the Bruni (foreigner) song sung at me more times than I care to remember, thrown up twice, ran away from 1 rather large spider, put up with cold showers and no water for showers, sweated from places I didn’t know could sweat, had my fair share of mozzie bites and shared a room each night with 8 other people (who luckily don’t snore). Along the way I’ve worked with an amazing team of fellows who are so passionate about teaching and are also happy to discuss the miseries of traveller’s tummy. We’ve planned together, debated the intricacies of teaching and become overexcited about getting real pancakes and cold juice for breakfast. I’ve also been privileged enough to meet and get to know so many Ghanaians who have welcomed us into their community. As well as sharing their classrooms with us, the local teachers have become part of a global teacher movement, supporting each other to improve lives through education. Saying goodbye to our new colleagues after the fourth and final day of conferences made it feel as if we were finished our project and going home.